This is a not very brief overview of my adventures in bookshopping. There's simply too much to say about each bookshop to post it all here. I'll share the full story of each bookshop experience in individual blogs. Or for a few photo highlights, scroll to the end. This week is Independent Bookshop Week, and while I personally think every week is a good week to visit an indie, I do love having an extra excuse to go on a bookshop crawl. The theme of this year's week is Bookshop Heroes, and as part of the celebrations the Bookseller's Association suggested I might want to take a trip to meet a few more of those heroes than usual by travelling around the Cotswolds. I packed my bags and my boyfriend into the car and set out on a three-day adventure. Setting off from our Kent home, the first few hours of our Saturday were spent in remarkably clear traffic on the M25 and M4, giving us time to discuss the adventure to come and me time to psyche myself up for wearing a superhero cape in public. I may not be a bookseller but the BA was happy for me to join in with the heroic fun. Even though I'd been there before, I was still nervous to be arriving at our first bookshop because I'm not used to being expected. It was therefore a relief to walk into The Yellow-Lighted Bookshop in Tetbury and be immediately welcomed with offers of coffee. This warm welcome and few minutes to pause and sit on the comfy bookshop sofa were exactly what I needed to recover from the long drive. My familiarity with the bookshop meant I had more time to chat with the bookseller, leaving my boyfriend to browse and occasionally comment on how impressed he was with the choice of books on offer. The conversation included bookshops (including a recommendation of an additional destination while we were in the area), books, the Cotswolds and the reason behind the unusual name. This last part of the conversation was the reason I bought The Yellow-Lighted Bookshop by Lewis Buzbee, but I could have easily left overloaded with other books. Next up came Cotswold Book Room. Probably the smallest of the bookshops during our tour, the thing that made this place special was the two ladies in charge. Cheerful and friendly and obviously filled with love for their bookshop and community, we had a great conversation with them and really enjoyed the enthusiastic welcome from these unassuming bookshop heroes. There was a limited offering of books but it still covered all the important subjects and catered for the reading children and adults of Wootton. I was delighted to pick up The Boy on the Bridge by M R Carey. Cotswold Book Room, named because it had started life as a room in a house, may be small but its heart is big and the experience was that of a small community bookshop – which seemed perfectly fitting for this destination. The Yellow-Lighted Bookshop made another appearance for stop three, as we visited the sister shop in Nailsworth. I’d been expecting a slightly smaller carbon copy of the first, when in fact we were greeted by another unique bookshop, with small nods towards the style of its older sister. Both were perfect in their own way. Louise the energetic and welcoming bookseller greeted us and all customers with a friendly smile, deftly responding to enquiries, recommending books and treating everyone like old friends. Where Tetbury had exuded reserved confidence, here the joy of books was pinned to the mast, further emphasising the different communities we were visiting. After some book discussion I selected Less by Andrew Sean Greer, because we both agreed it looked fun. Stop four was actually an unplanned diversion because in all our conversations with the previous three places Stroud Bookshop kept being recommended. Three out of three recommendations meant we had to investigate. Found in what I assume must be a market town because there were market stalls everywhere, my first instinct was that this appeared to be the most functional bookshop we visited. That's an observation, rather than a criticism: decor is simple and shelves well-filled. We missed the owner, but conversation was lively as we got chatting with both booksellers and customers. Stroud is clearly a place where people are willing to talk to strangers, something other towns might benefit from considering! Here I chose Elizabeth Strout’s My name is Lucy Barton. Finally, our first day of bookshop crawling ended with bookshop heroes for the younger generation, in Octavia’s Bookshop, Cirencester. “Flying” Moomins fill the window, and there’s a feeling of warmth and colour the moment you step through the door. A buzz of enthusiastic children filled the shop, which it was simply wonderful to hear. I was particularly impressed to see the labelling of the bookselves, which are organised by age and fiction or reference, with an area towards the back – commonly the home of “children’s” – simply labeled “adult”. It was a nice reversal of the usual bookshop layout and obviously works well here. I got into the spirit of my surroundings by choosing Robin Stevens’ Murder Most Unladylike. Five bookshops down, it was time to take a break, as we headed for The Angel at Burford in preparation for the next round of adventuring. Sunday was a much more gentle journey, beginning with a short walk from our hotel to the Madhatter Bookshop. Four people manage the stock here, and their various areas of expertise were clearly demonstrated with the excellent, often unexpected, range of titles on offer. This caused me quite a lot of difficulty in my attempts to limit my purchase to just the one book. Throw in the selection of hats for men and women and this is a bookshop you could easily spend a whole morning enjoying. We resisted the hats in the end, with me choosing Money by Emile Zola, and my boyfriend picking up David Bellos’ The Novel of the Century (which was fortunately one of the books I'd been agonising over leaving behind). Lunch was replaced with a generous serving of tea and cake at Jaffe and Neale in Stow-on-the-Wold. Being at the halfway point on our journey, this proved a welcome pause to sit and enjoy the bookshop surroundings from the comfort of two easy chairs. It turns out it's much less effort to investigate the bottom shelves of bookcases when you're already sitting comfortably! Conversations with the bookseller and various browsers ensued and a fine time was had by all in what I think was the youngest bookshop of the weekend. I surprised myself by selecting Ann Patchett's This is the story of a happy marriage, while my boyfriend was again tempted into buying, this time choosing Landscape Photographer of the Year. Meandering over to our third stop of the day, we found ourselves in the same town as Blenheim Palace. The glimpse we had through the gate looked stunning and could've made an excellent addition to our visit. That wasn't to be though because we simply had too much fun in the Woodstock Bookshop. Two perfectly-filled rooms mean this was one of the smallest places we visited but it kept us the longest. This was partly because of conversations with the bookseller, partly because I was enjoying how much my boyfriend was enjoying the bookshop and got distracted from my own mission of buying a book. Stock includes a range of unexpected titles, small publishers and a good mix of translated fiction, so we ended up leaving with three books here. I chose The Infatuations by Javier Marias, while he picked Secondhand Time by Svetlana Alexievich and Doughnut Economics by Kate Raworth. Completing our day with a glimpse of the previously-mentioned palace, we drove to nearby Oxford to spend the night in a Fuller's pub which gave us 15 per cent off because we booked direct – further proof the internet isn't always the cheapest option. It was an early start on Monday, as I dropped my partner in bookshopping at the railway station so he could go to work, before setting out on the final day alone. Not that I ever really felt alone with all the bookshop hero booksellers to keep me company. My day started at Jaffe and Neale bookshop in Chipping Norton, another place I'd previously experienced. Enjoying a second breakfast of tiffin and coffee, I chatted with the booksellers and found out more about their bookshop, other bookshops and books in general. This is a cheery, bright destination and I particularly enjoyed seeing their upstairs reading room, which another browser had already made herself comfortable in. Hearing the bookseller talk about his love for his current favourite book, I found myself compelled to buy The Overstory by Richard Powers. That said, there was an understated conviction in his words about every book discussed, so I could easily have left with an entirely new library if I'd had the car space and money. Stop two saw me return to Stow-on-the-Wold, to this time visit Borzoi Bookshop and meet furry bookshop hero Molie. The two human booksellers had much more to say about books and the bookshop than she did, but all three were a treat to meet as I explored this attractive rabbit warren. I was given a quick tour and a coffee and let loose to wander, taking in a good selection of history and biographies and enjoying the variety of small publishers mixed in among the big names. After some discussion, I was again easily convinced to choose a book loved by the bookseller, this time buying Pachinko by Min Jin Lee. Travelling north, my journey took me through some truly beautiful countryside to what must be the very top of the Cotswolds and Blandford Books in Broadway. Two shops linked together, visitors have the option of turning right for general books, left for children's, or continuing to the back for cards and gifts. I explored the lot before settling next to the fiction, being tempted by each of the books highlighted by handwritten recommendations attached to the shelves. Most of these titles were unknown to me, meaning all were very tempting, with a conversation with the bookseller helping me to narrow it down to the one chosen book: Together by Julie Cohen. This seemed like a lovely town to explore but at this point I was on a time-limit: I had to find a convenient, safe, place to pause for an interview live on air on BBC Radio Gloucestershire. It was a brief chat about the importance of supporting independent bookshops, with local bookshops being interviewed throughout the week. I'm always happy to help remind people of the value of these community gems and I do hope some of the listeners took note. The media continued to call in my final bookshop of the trip, with a photographer from the local paper arriving at Cheltenham's Suffolk Anthology before me. It was a little embarrassing posing for photos when I'd barely said hello, but our surroundings were beautiful and it's nice to know my marathon bookshop crawl had caught people's attention, and hopefully inspired them. Once the photographer had gone, we settled into chatting books, the community and the bookshop, while I also explored my surroundings and we posed for our own pictures with the capes. This was one of those rare bookshops where around 50 per cent of the fiction can already be found on my own bookshelves, so I decided to put my complete trust in the recommendations of the two women. I was confidently handed Girl waits with gun by Amy Stewart, and while I'd not previously heard of the author, there was no doubt about my decision to buy. And with that my bookshop crawl came to an end. It was a really lovely three days of sunshine, bookshops and adventure. Where some people go on holiday and explore a foreign country, my long weekend combined all the elements of exploration (inspired by bookshops), memento-buying (of books), and meeting the locals (aka those wonderful bookshop heroes) without the expense and stress of an airport. You don't have to visit 12 bookshops in three days, but letting bookshops inspire you to visit new places (in the real and imagined world) is definitely a recommended experience – and one that will make you a bookshop hero too. Okay, so the headline of this post might be ever so slightly misleading, I'm not suggesting you all drop everything and join me in my car, but it would be good if you all joined in with a bookshop crawl. We are just a few days away from one of my favourite times of the year, Independent Bookshop Week, which runs from 16-23rd June. Launched in 2006, this is a week to highlight the important part indies play in their communities, including the excellent – some would say heroic – service they provide. To mark the start of this celebration I'm going on a bookshop crawl. And not just any bookshop crawl. This one is going to last three days and cover I dread to think how many miles as I travel from town to town to meet 11 indies in the Cotswolds, all supported by Books are my Bag. 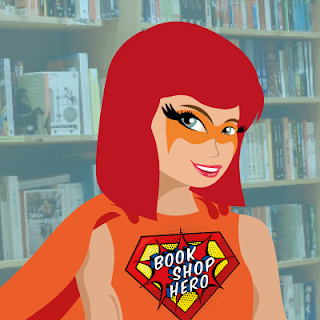 Books are my Bag has drawn me as a superhero because the theme of this year's IBW is bookshop heroes. They're asking book lovers to shout about their favourite bookshops and bookselling heroes, while the bookshops themselves are also asked to share their own bookshop heroes, all using the hashtag #BookshopHeroes. I'm really looking forward to following these tweets to find out about bookshops I should be adding to my must-visit list – perhaps for my next bookshop crawl. As I said, it's not physically possible for you to join me in my car (although it would be fun), so I'm instead inviting you to follow my adventures as they happen on Twitter; come back here and read about them afterwards; or – and these options aren't mutually-exclusive – set off on your own bookshop crawl and have your own adventure. 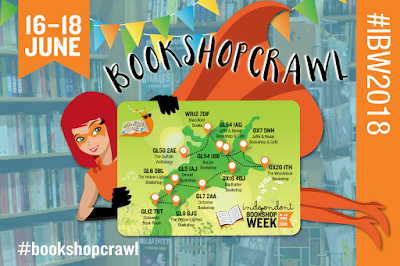 Just make sure you remember to join in using the hashtags #IBW2018 and #BookshopCrawl. 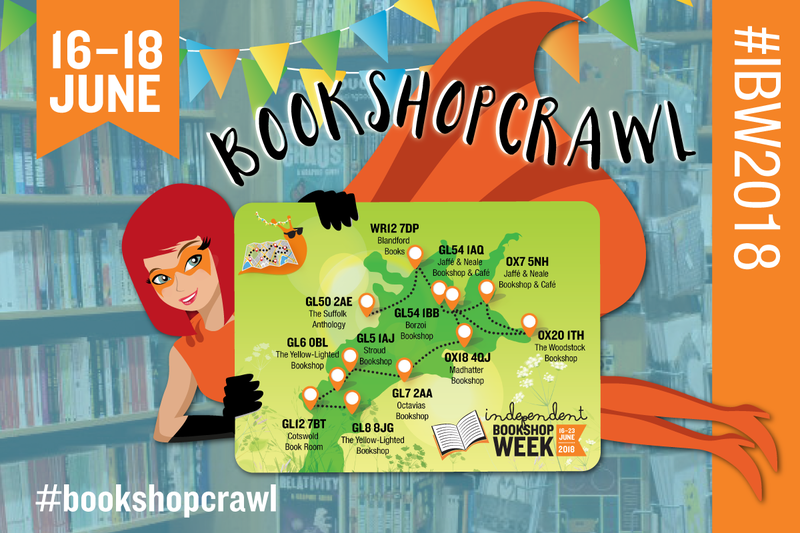 The 'official' bookshop crawl day is 16th June, but mine will be taking place over three days and many bookshops will be holding special events and promotions throughout the week, so there's no limit to the possibilities of taking part. In the past I've celebrated bookshop week by walking across London, driving around Essex, walking around London and driving around the south, so don't feel restricted if you only live in a one-bookshop town. Part of the fun of bookshop crawls is about getting out and 'meeting' places you perhaps wouldn't usually encounter. These are new beginnings that might just become a more regular part of your life. I write from experience, because although I can't easily re-visit the hundreds of bookshops I've met through this blog, I have gained friends and favourite places in some unusual corners of the country. While I don't pretend to say five minutes in an independent bookshop will change your life (it might), I do believe becoming a bookshopper, meeting booksellers and buying books in the real world has made my own life richer. So join in the fun and see where a bookshopping adventure takes you. It could be the start of a new way of life, but even if it isn't, you'll still have a new book!